One of the world's largest futures and options exchanges Deutch Borse which is an U.S. based CME group and an operator of Frankfurt stock exchange R-ADA group ,BSE and Kotak have lined up to purchase financial technologies (INDIA , FTI.L) stake in commodity bourse MCX . Whereas FTIL owns 26% in MCX , the only listed exchange and India's largest commodity bourses found to be unfit to hold more than 2 % in the exchange by the commodity market regulatory FMC following as Rs 5600 crores payment crises at its subsidiary National Spot Exchange (NSEL) in last year July. Its only just a few days back that FMC directed the MCX board to ensure that FTIL'S stake was cut to 2 % from 26 % by this April end ..Months later now FMC issued the not fit and proper order against the FT\IL which FTIL has legally challenged as SEBI found the company unfit to be a shareholder in MCX stock exchange ,m Delhi and Vadodara stock exchange . Although FTIL has told the regulator that the process of identifying one or more buyers of its stake would take eight weeks approximately subject to the regulatory approvals. So the unloading of its stock will thus take longer than that FMC'S April end deadline given to MCX .. The FTIL shares ended at 369.70 down by 1.74 % while the shares of MCX DECLINED TO Rs. 486.95 . 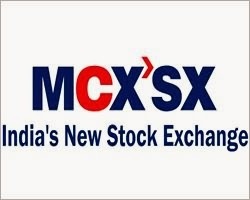 The exchange has lost value basically because of a Rs 5600 crore scam at NSEL which is a subsidiary of FTIL .Another thing was the transaction tax imposed on non farm commodities since july last year , so the MCX;s which hit the record high of Rs - 1,617 crores in Nov second week fell as low as 85% after the NESL crisis broke out ..
FTIL has sold its stake in fully owned overseas subsidiary which is a Singapore Mercantile exchange to ICE group for $ 150 million dollars that’s Rs 900 crores and its warehousing arm NBHC to India value fund advisory for Rs 242 crores .